“I wonder what his name is?” Little Suzi said to Albert. Maybe it’s the same as the pony in the book your teacher read to us. Tony, Albert remembered . . . Tony the Pony. But then Suzi didn’t know what to do next, because the pony just stood quietly by the fence with one big cloudy eye turned toward her. “What do we do now, Albert?” Little Suzi asked her friend. Let’s ride him! Albert suggested with enthusiasm. How do you know he’s old? Albert queried. Blind and deaf? Albert was curious now. Oh!, Albert said with some amazement, you’re pretty smart. In the story book, the children feed Tony a carrot, Albert recalled for her. Maybe he likes apples too. So Little Suzi offered her apple to ‘Tony’, who reached his long nose far out over the fence, curled back his thick lips from his big yellow teeth as long as piano keys, and slowly and carefully picked the rest of Suzi’s apple from her outstretched little girl’s hand. He likes it! Albert said with satisfaction. See, he likes it! After that, Albert and Little Suzi stopped by after school almost every day with an apple for Tony. But one day, right before the end of the school year, Tony the pony did not come out from the barn for his apple. And the next day, he didn’t come out again. After a week, Suzi became sad at home and at school. When her teacher asked why, she just said ‘nothing’ because she didn’t know how to explain it to her teacher. And at home, she just said ‘nothing’ because she didn’t know how to explain it to her mother. He must be sick, Albert offered one day. The little girl became sadder and sadder when Tony the pony did not show up again for two more days. Then Albert convinced her to ask her mother about their new friend. “Oh,” Little Suzi replied with a pouty lip, but she felt a little better that Tony might still be her friend. “And Albert too?” Suzi asked. The next day, Suzi’s mommy waited until Little Suzi came up the sidewalk on her way home from school. Inside the house, the sweet lady first gave Suzi and her mommy gingerbread cookies in her cozy sitting room. Hey, how ‘bout some milk with these cookies? Albert protested. And while Suzi and her mommy enjoyed their cookies, the sweet lady picked up a thin book with a gold spine and held it up where they could see the cover. Hey, that’s the same exact book your teacher reads to us! Albert exclaimed in Suzi’s little ear. “Tony the Pony!” Little Suzi exclaimed. “Like Chico?” Suzi asked her mommy. 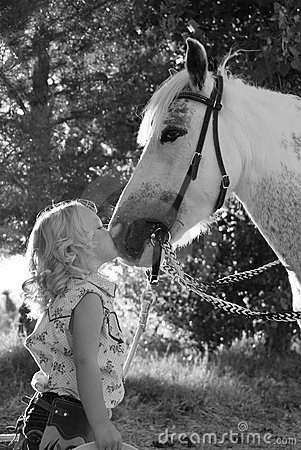 As she spoke, the kind lady gave Little Suzi a photograph in a frame—a photograph of Tony the pony in his younger days, surrounded by excited children feeding him apples and petting his nose and long mane. He was beautiful and happy. And Little Suzi held the photograph in her lap the whole time while the lady read “Tony the Pony” to her, Albert, and her mommy. Very good, Kyle! Sweet story with such vivid descriptions. How do you come up with “yellow teeth as long as piano keys”? Thanks for sharing this children’s treasure.